Pandora's Box; The Paradise of Children. New York: McGraw-Hill, 1967. 61 pages. Two-colour (black line, aqua wash) illustrations throughout. Bound in blue cloth with an illustration (smaller version of dust jacket illus.) in black on the front, lettering in black on spine. Decorative endpapers in aqua and grey. Binding is tight, boards show only minor rubbing to sharp corners, book is clean save for library depredations consisting of tapemarks to boards and endpapers, single inkstamp to copyright page and another to an interior page margin, pocket etc. on rear endpaper. Dust jacket is priceclipped, clean with no spine label but a small J in white ink, spine is sunned, tiny chip at top of front foldover, very minor tape shadows to flaps, looks very nice in new mylar cover . Altogether an attractive ex-library copy of a very uncommon book by two-time Caldecott honor illustrator, in scarce dust jacket.. First Thus. Hard Cover. Good to Very Good/Very Good. Illus. by Paul Galdone. 6.25 x 8.25 in. (16cm x 21cm). Ex-Library. 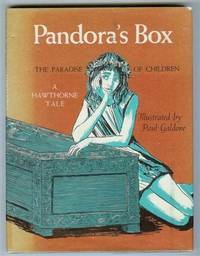 Pandoras Box; The Paradise of Children. Mcgraw-Hill (Tx), 1967-06. Hardcover. Good. Mcgraw-Hill (Tx). Used - Good. Ships from Reno, NV. Former Library book. Shows some signs of wear, and may have some markings on the inside. 100% Money Back Guarantee. Shipped to over one million happy customers. Your purchase benefits world literacy! McGraw-Hill. Hardcover. 0070273189 A Good copy. Hardcover. Pages sharp and clean. No marks or highlighting in text. Book is as issued without a Dust Jacket. An excellent Ex-Library Copy with normal library markings and stamps. Cover corner tips bumped. This book has NOT been marked as a remainder by the publisher. Accurate Detailed Descriptions with Fast Shipping and Robust Packaging. WHT106H . Good. McGraw-Hill. Hardcover. POOR. Noticeably used book. Heavy wear to cover. Pages contain marginal notes, underlining, and or highlighting. Possible ex library copy, with all the markings/stickers of that library. Accessories such as CD, codes, toys, and dust jackets may not be included.